OK admission time... Story telling just isn't my forte! I'm rubbish at it, I feel a complete plonker doing voices and skip through pages as quickly as I can. It was great when T was a little younger and his stories were short and based on pictures but truth be told, I need help! As much as I love reading myself, reading out loud is something I find really difficult, so T and I have been practising a lot lately. First we downloaded the storytime app Becky recommended over at 3princessesand1dude we have been having lots of fun with this, T loves the interaction and I'm trying to encourage him to tell the stories as well as have stories told to him, he's enjoying telling his tales, although they generally are an adaptation of the one you've just finished telling! There are about 25 items in our current box. We've not had a chance to tell too many stories at the moment, but so far we've had a pirate who played rugby on the beach with a robot and bugs bunny who stole all my carrots from the kitchen! 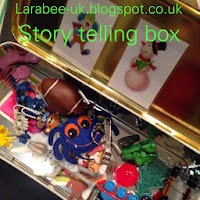 This has been quite a hit for T, this morning he even asked to tell stories from the box instead of watch TV! I think this activity will teach us both lots about creating our own stories and speaking out loud and in the process help each of us develop our storytelling abilities. After the excitement of Christmas and new year is over, I plan to get back to our monthly themes and I plan to base our story telling box on that theme, although I'll ask T to add a few bits and bobs too! Hope your son enjoys this if you try it Janice!